On a recent trip to New York, I visited friends who live in Manhattan, and who know the food scene there. They brought me to Robert, a restaurant on the 9th floor of the Museum of Art & Design, which is on Columbus Circle, directly across from Trump Tower and Central Park. I presume it is named for Robert Olmstead, the designer of the park. I’d say it had a million dollar view, but in New York, that would be a $10 million, but I can get for you at $6,999,999! 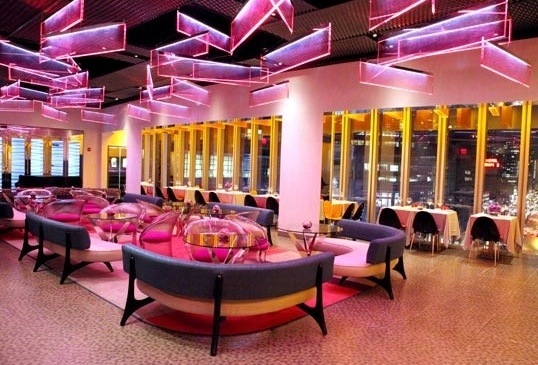 The design is ultra modern/retro, with unique touches like sculptural table dividers, high tables with bar stools, couch cocktail stlye tables, and traditional tables. The staff is knowledgeable, gracious and attentive. They have an interesting cocktail list, with a mix of new and old. One of my friends enjoyed the Olmstead, made with Hendrick’s Gin, Rosemary, Thyme, Basil & Honey. The menu has a good selection. We started with SHRIMP & AVOCADO SALAD with Gazpacho Vinaigrette. This could have contained a bit more avocado, but it was delicious. We had two orders, one of which was split in the kitchen, and the split portion was almost as generous as the single portion! Another appetizer was BLUE BAY MUSSELS with Spanish Chorizo, Scallion, Grilled Herb Bread. I thought this was very good, especially the broth, but one of my buds said they were slightly tough. I didn’t think so, but I’m a Californian. The standout item was an appetizer to share, that Kathi had for her entree, the TUNA CARPACCIO PIZZA with Puff Pastry, Trout Caviar, Spicy Aioli. The buttery taste of the puff pastry really enhanced the richness of the tuna and caviar, and the aioli was perfect. A great meal in a classy, elegant environment with a super view. I’d go back. Don’t forget to stop at the gift shop for great design souvenirs. 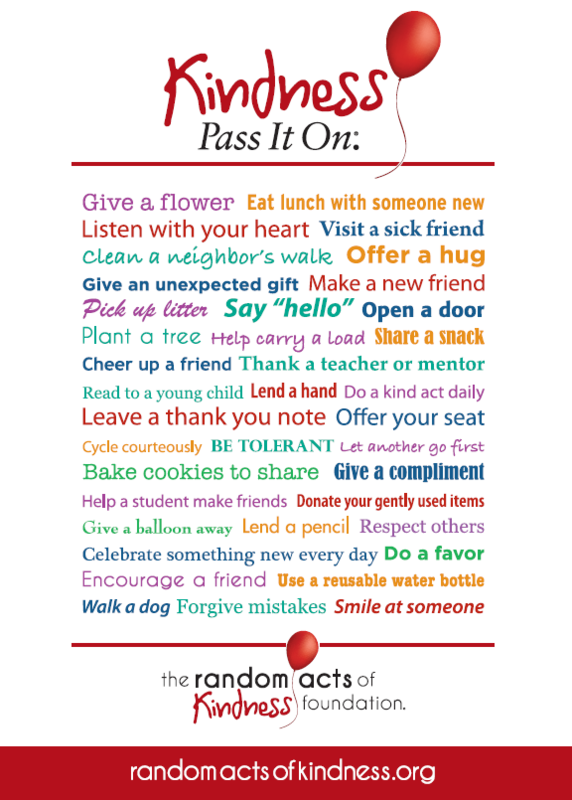 LOVE the ideas expressed in this poster! What do you do when a Pastry Chef gives you just-baked artisan English muffins? 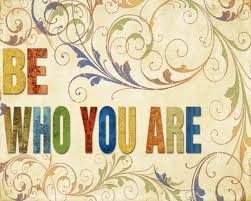 You create something worthy of such a gift. Something that will be respectful of the baked good, and let it stand out, yet builds upon it, lofting it to even higher levels. 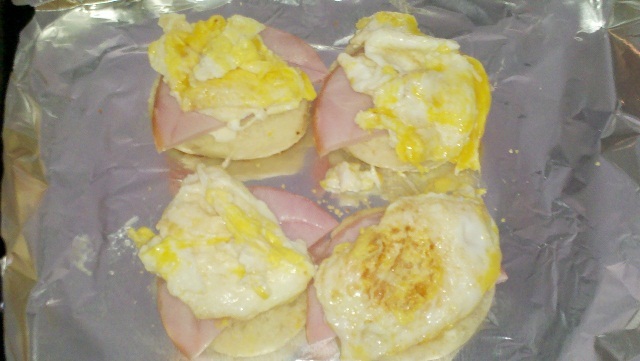 OK, on with it: I made Mark McMuffins, a variant on Mark McBagels (previously described). To make 4 muffin halves: I’d like to say this served two, but uh-uh, Susi wasn’t home; the muffins were smaller than store-bought; and I ate ‘em both folks! 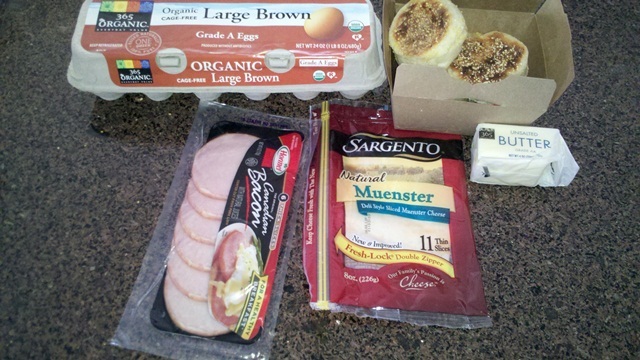 (We had a couple more muffins for Susi to enjoy for the next day). I very lightly toasted the English muffins, really just to warm them from their overnight stay in the fridge, then lightly buttered them. Add one half slice of Canadian bacon. I pan fried two eggs just until the whites were set. I broke the yolks in the pan, but move the eggs around enough so they didn’t quite cook through. You could also do this with soft scrambled eggs or poached eggs. 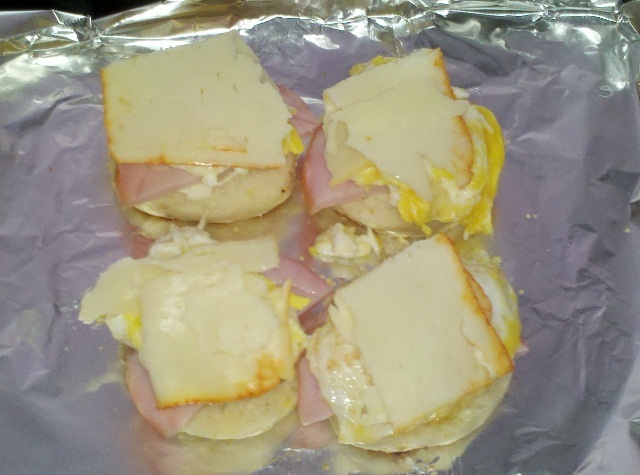 I placed approximately one half an egg on each muffin, then topped with a half slice of muenster cheese, and baked at 400 for about 5 minutes. Note: if you would like tomato in this, put them under the eggs; I usually do, just didn’t this time. 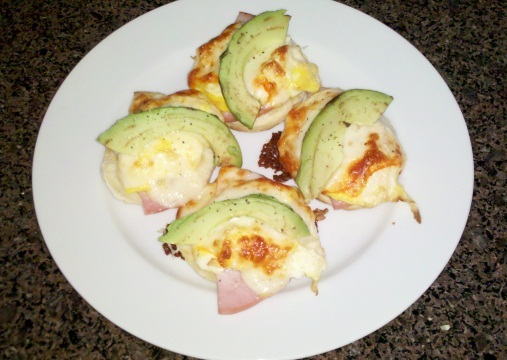 During the last minute of cooking, I put a slice of avocado on each piece. 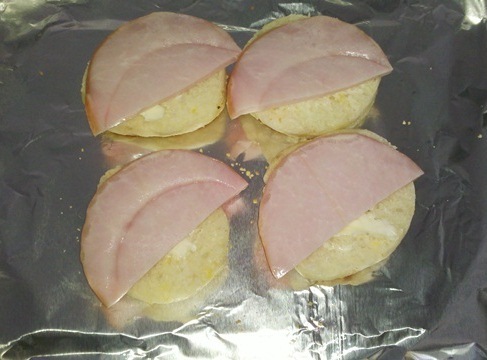 When it was done, I applied cracked black pepper (no need for salt – there is enough in the bacon and cheese). Notice how the muenster has just started to caramelize! This is ideal. The fresh muffins were delicious, and I now pronounce this dish superior to a Mark McBagel! Andrei’s Conscious Cuisine in Irvine, CA is my regular hangout. 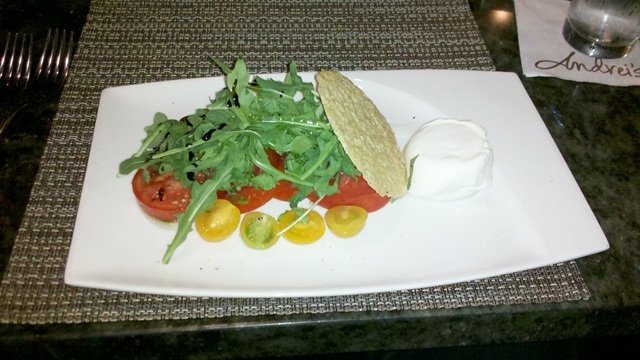 Their regular menu has an excellent choice of dishes, with appetizers that could be a full meal, very fresh salads, and entrees that can please any palate. Where the Chef (Yves Fournier) really gets to shine is in daily specials. 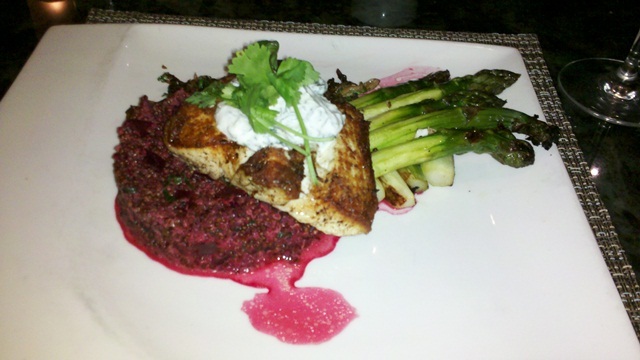 Halibut served over red beet quinoa, with a yogurt herb dressing, and wonderful asparagus…. 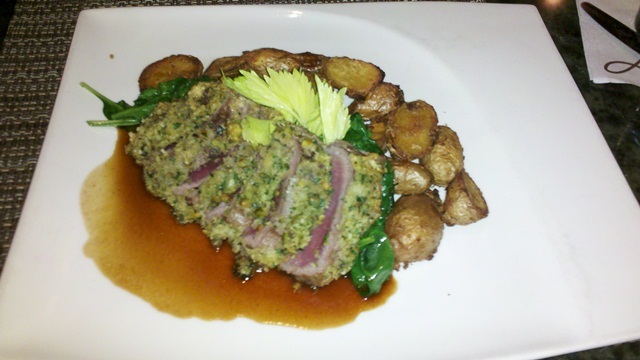 … …and pistachio and mustard crusted loin of lamb, served with roasted garlic potatoes. 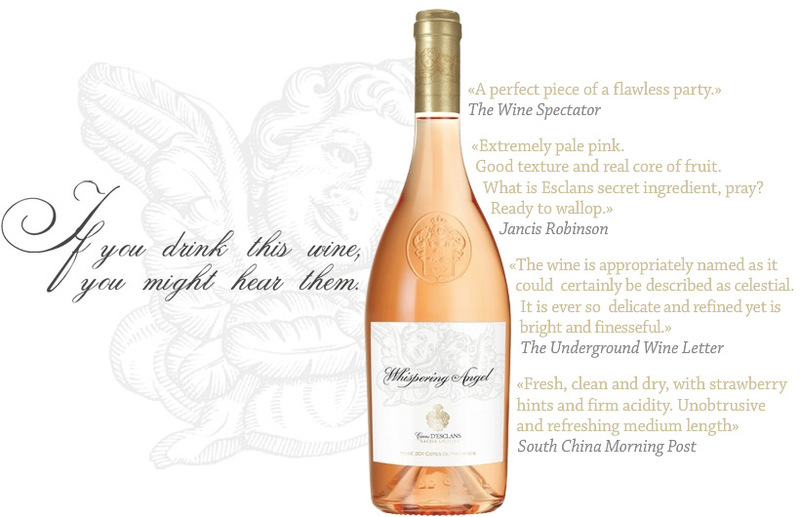 Susi was in the mood for Rose, so we got a bottle of Whispering Angel by Chateau D’Esclans (Cote de Provence). The food was exceptional! We shared a goat cheese cheesecake for dessert and found this to be another perfect Friday night dinner to start off our weekend. On the way in, we ran into our buddy, pastry chef Elyssa Fournier, who had been baking english muffins for Mother’s Day brunch. She gave us a bunch to take home, and I was inspired to make a “Mark McMuffin” – but that is for a separate post! Jamie Oliver’s Food Revolution Day is today, Saturday, May 19th. Mission is to increase awareness of the importance of healthy eating especially for children and in our schools. See the map for activities in your area. Read about what Jamie is doing worldwide with the donated funds and with his foundation. Consider donating 10% of what you spent on food this week (including dining out and entertaining) to the cause!